The Archetypal Podcast returns from its Summer Sabbatical with its Twelfth Edition starring the eleventh Tarot card, Strength. 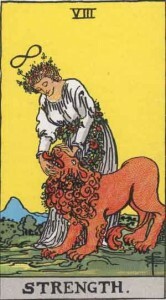 After a turn on the Wheel of Fortune our Hero/Fool is taken in a new direction and learns from the Lion and Maiden depicted in this card. Inner strength is called for with the knowledge that it’s made up of patience, self-control, and the awareness of one’s instincts and drives. Archetypal Consultant Julienne Givot gives us the breakdown of the empowered and disempowered archetype of the Damsel and reflections on Beauty and the Beast. Tarot Consultant Cyndera Quackenbush regales us with a retelling of an ancient Korean myth about a woman’s lesson in true courage. See below for a written version of the story. “If the potion is important enough, you will succeed,” the hermit said. He turned his head away, not wishing to talk anymore. The young woman went home. She thought a great deal about how she would get the tiger’s whisker. Then one night she crept from her house with the most delicious morsels she had cooked especially for her task. She went to the place on the mountainside where the tiger was known to live. Standing far off from the tiger’s cave, she held out the food, calling the tiger to come and eat. The tiger did not come. The next night She went again with some well-prepared food, this time a bit closer. Again she offered the food to the tiger. Every night she went to the mountain, each time a few steps nearer to the tiger’s cave and even though fear caused her knees to shake she took these footsteps forward. Clutching the whisker tightly in her hand, she backed away slowly, thanking the tiger softly and then went down the path, walking not running, towards the mountain hermit’s house. The hermit took the whisker and examined it, his face alit by the flames of his firepit. Satisfied that it had really come from a tiger, he leaned forward and dropped it into the fire. It vanished immediately in the smoke. Hearing this, the young woman stood speechless for a moment. Then she went down the trail, walking but not running, towards home.